The filters for a new IVGEN system, a water filtration unit to purify water for IV drips in space, have to work when there is no gravity, which presented unique hurdles to the designers. Anew water filter system that could pave the way for emergency intravenous (IV)operations to help sick astronauts in space is about to get the ultimate teston NASA?s next space shuttle flight. Thenew space technology, set to launch Monday on the spaceshuttle Discovery, is designed to filter out microscopic contaminants fromdrinking water to produce a fluid sterile enough for IVs in case they are neededin a medicalemergency in space. If successful, it could also be used by the UnitedStates military in remote field operations, on submarines and ships, as well asin medical relief efforts, researchers said. "IVfluid production anytime, anywhere, has great medical benefit on the ground aswell as in space," said Philip Scarpa, medical operations manager atNASA?s Kennedy Space Center in Florida, where Discovery is set to blast offMonday morning at 6:21 a.m. EDT (1021 GMT). Scarpa?steam worked with researchers at NASA?s Glenn Research Center in Ohio to developthe new filtering technology. The study, nicknamed ?Project Clearwater,?resulted in IntraVenous Fluid Generation (IVGEN) water filter. Researcherssaid the device marks a huge step forward in improving water quality duringspaceflights. Discovery will also deliver a new space waterrecycling device that converts waste hydrogen and carbon dioxide gas backinto potable drinking water. Theshuttle's ascent into space may be visible, weather permitting, to skywatchersall along the East Coast of the United States [howto spot the shuttle launch]. Whenit comes to medical supplies in space, IVs can be difficult to come by. Onechallenge is their relatively limited shelf life, due to the need forsterility. And since IV fluids also take up a lot of volume (they weigh morethan 2 pounds per liter), astronauts can only be supplied with an extremelyrestricted amount of fluids in space. Thespace station typically has a supply of about 12 liters of fluid and any giventime. One recent NASA study reported that a mission to Mars may need as much as248 liters of IV fluids on board, researchers said. Currently,NASA?s medical experts have identified at least 115 different scenarios inwhich a sickor injured astronaut could need an IV while living on the space station,mostly for rehydration of medicine delivery. ?Onboard or ?in-situ? production of IV fluids needed for medical treatments, couldgreatly reduce these costs and storage limitations, and would give NASA muchmore flexibility in how it can use the water it already has on the spacecraft,?Scarpa said in a statement. TheIVGEN is a suitcase-sized device that produces IV-grade water from availablespace station drinking water. It filters out microscopic contaminants likeheavy metals and toxins. 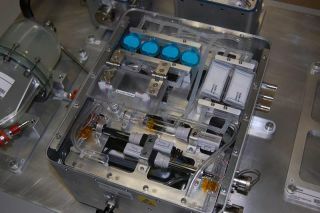 It will be mounted inside the space station?s scienceglove box during its test, researchers said. Thebiggest risk is the formation of bubbles due to the lack of gravity in space. "Bubblesare probably the biggest concern," Scarpa said. ?Bubbles in IV fluids aredangerous for a patient as well. If entered into the veins, they could cause astroke by blocking the brain?s blood flow.? Scarpa?steam devised micron-sized filters to trap and squeeze out the bubbles from thesystem. DuringDiscovery?s STS-131 mission, astronauts will run water through the IVGEN filterfrom a storage bag and run several cycles, then freeze the resulting water soit can be analyzed on Earth. The equipment is slated to be returned on a latershuttle flight. The way IVGEN works is to transfer water from the station container's supply toan accumulator, which forces that water through a series of filters. The wateris dispensed into an IV bag, similar to the kind used in hospitals. Onceinside the IV bag, which also contains salt and a stir bar, the fluid is thenthoroughly mixed together with the salt. This should result in a salinesolution, same as the IV fluid used on Earth, then goes through one last checkto make sure it?s completely mixed before being collected and frozen byastronauts. "Aperfect result would be to have output water that satisfies the strict standardsfor water for injection without any failures or performance issues,"Scarpa said. Discovery?sSTS-131 mission is one of NASA?s four finalshuttle flights before the space agency retires its three orbiters laterthis year. Theshuttle?s seven-astronaut crew is hauling a 27,000-pound (12,246-kg) cargo podfilled with supplies, science equipment and spare parts for the space station.The mission is slated to last 13 days. Three spacewalks are planned. What Happens When Astronauts Sneeze? SPACE.comis providing complete coverage of Discovery's STS-131 mission to theInternational Space Station with Managing Editor Tariq Malik in Cape Canaveral,Fla., and Staff Writer Clara Moskowitzbased in New York. Click here for shuttlemission updates and a link to NASA TV.